Now is the time to start thinking about all the great things that you can do in your garden this year! So, if you have ever thought that Aquaponics might be something that you would like to try, but didn’t know where to start this would be the perfect thing for you to begin with. Even if you know a little about Aquaponics, this workshop will give you a much greater grasp on the mechanics of the systems and their capabilities. For this workshop, we will have over SEVEN HOURS of instruction where we will cover just about everything that you need to know to go home to build and operate your own Aquaponic system. 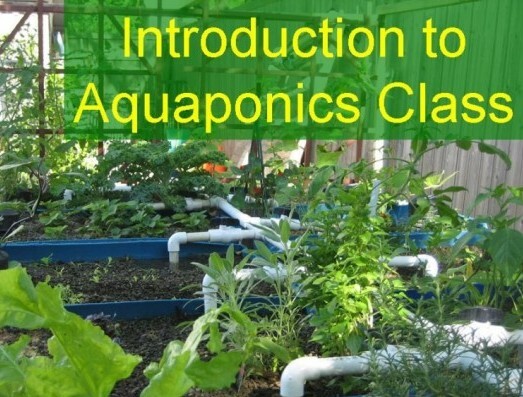 For the morning session will go through our “Aquaponics 101” curriculum (detailed below), and then we will have lunch with an informal Q&A to discuss some of the specifics related to “Texas” Aquaponics. Afterward, the afternoon session will be a hands-on construction opportunity to build a demonstration system using the most common component for a backyard AP system — an IBC tote. Specifically, we will go through the steps to build a system from one tote, and then how to expand it with a second. REFUND POLICY: If you are not satisfied with the quality of the workshop, we will refund your money in full. Hands-on construction of the system from start to finish.